This example of the Eames Storage Unit was one of the larger cabinets from the collection. The range was intended for either commercial or domestic use, and was based on a system of interchangeable parts. Customers could choose the size of the piece, and the arrangement of panels (flat or 'dimpled'), drawers, materials, colours and finishes. There were two main sources for the design. The first were the modular storage systems that had been developed for domestic use in Germany in the 1920s. The second was American metal office furniture of the early 20th century. 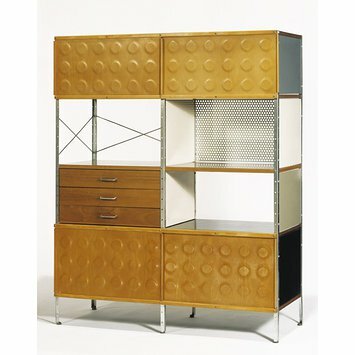 The Storage Unit was also intimately related to the Eames's own house, which was designed at the same time. Like the unit, the house had a steel framework with different coloured panels set into it. 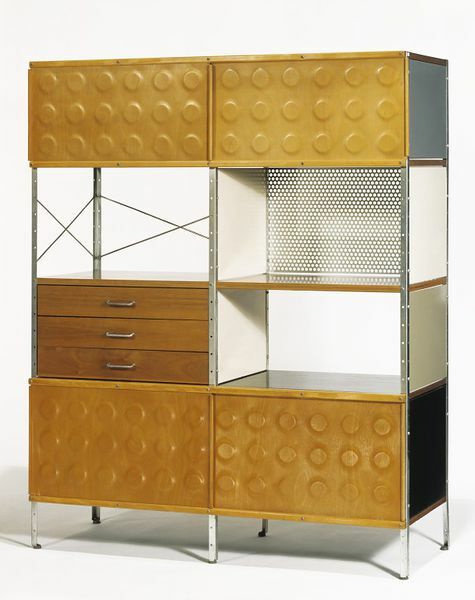 Storage unit with four tiers with sliding doors of moulded plywood on top and bottom; 3 drawers; perforated metal and masonite panels of grey and beige. The ESU (Eames Storage Units) was marketed as a modestly priced, industrially-based, knock-down design for the modern interieur. Its elements were part of a interchangable system that allowed users to virtually design their own storage system. The basic steel frame units were made in different sizes. It allowed two widths, three heights and one depth. The frames could be fitted with a large variety of drawer units or open or closed shelving. The latter came with wood or plastic sliding doors. The sides and back could be enclosed by wire struts, metal grilles, plywoods and solid or laminated plastic. This example came from the office of a mid-Western, American architect. It is unusual in its subtile grey and tan colours; the red, blue and white versions were more common. This unit is from the very first production with the original steel legs, a detail dropped when the firm decided to ship the units erected rather than knocked-down. The Storage Unit is often associated with the Eamses' own house designed at the same time. The house and the storage unit have similar technical features and aesthetic qualities: the undisguised structural components were used for a decorative effect. Both the storage unit and the house were made of parts derived from industry and their appearance was based on a steel frame, reinforced by wire struts. Wilk, Christopher, ed. . Western Furniture 1350 to the Present Day. London: Victoria and Albert Museum, 1996. p.214-5, ill. ISBN 085667463X. Designed as an interchangeable kit of parts, and using industrially derived elements from materials such as steel and plywood, the units were meant to be an affordable and flexible system for use at home or in the workplace. The same principles of prefabrication and adaptability were applied to the Eames' house in California, completed in 1949. The Eames Storage Unit collection was based on a system of industrial, interchangeable parts. Customers could choose the size, colour, materials and finish of their units. This early example has a natural finish, but others are in the mainly red, blue and white colour scheme of the Eames’s own house.